The rate of most of the chemical reactions increases with increase in temperature. The rate constant nearly doubles with rise in temperature by 10° for a chemical reaction. Arrhenius Equation: This equation shows the dependence of rate of a chemical reaction on temperature. Here, A is the Arrhenius factor (or frequency factor), R is gas constant and Ea is activation energy. To understand this equation, let us take example of following reaction. According to Arrhenius, this reaction can take place only when a molecule each of hydrogen and iodine collide to form an unstable intermediate. The intermediate exists for a very short time and then breaks up to form two molecules of hydrogen iodide. 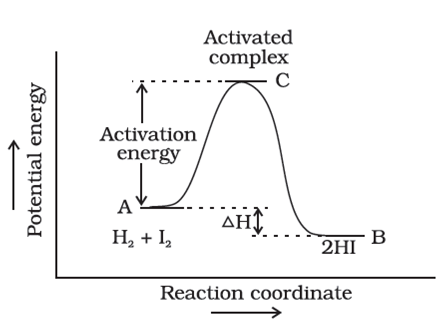 The intermediate is called activated complex (C), and the energy required to form this is called activation energy (Ea). This graph is plotted for potential energy vs reaction coordinate. 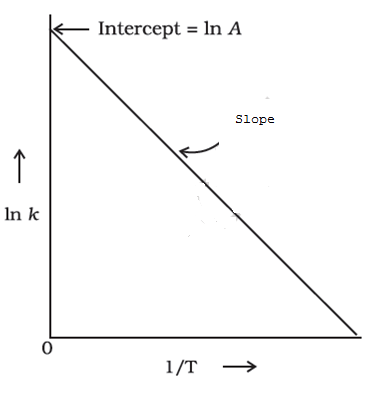 The reaction coordinate shows the profile of energy change during the course of reaction. Final enthalpy of reaction depends on the nature of reactants and products. All the molecules in the reacting species do not have the same kinetic energy. Ludwig Boltzmann and James Clark Maxwell used statistics to predict the behavior of large number of molecules. According to them, the distribution of kinetic energy may be described by plotting the fraction of molecules with a given kinetic energy vs kinetic energy. Here, NE is the number of molecules with energy E and NT is the total number of molecules. 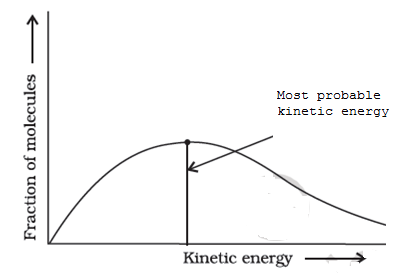 The peak of the curve corresponds to the most probable kinetic energy. Molecules with energies higher or lower than this value are less in number. When we raise the temperature, the maximum of the curve moves to higher energy value and the curve broadens out so that a greater proportion of molecules get much higher energies. So we can find Ea and A using these values. A substance which increases the rate of reaction (but itself does not undergo any permanent chemical change) is called a catalyst. Intermediate Complex Theory: As per this theory, a catalyst forms temporary bonds with reactants to make an intermediate complex. This complex eventually decomposes to yield products and the catalyst. A catalyst reduces the activation energy and thus lowers the potential energy barrier. Thus, the catalyst provides an alternate pathway for the reaction. A small amount of catalyst can catalyse a large amount of reactants. A catalyst does not alter Gibbs energy. A catalyst catalyses spontaneous reactions but does not catalyse non-spontaneous reactions. Moreover, a catalyst does not change the equilibrium constant, rather helps in attaining the equilibrium faster. 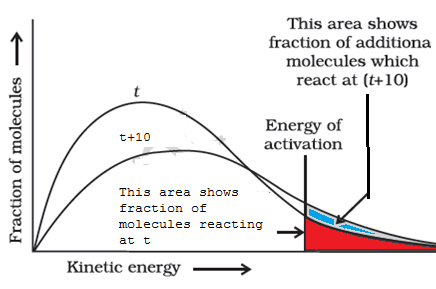 Here, ZAB is the collision frequency of reactions, and e-Ea/RT is the fraction of molecules with energies equal to or greater than Ea. This equation fairly accurately predicts the value of rate constants for reactions which involve atomic species or simple molecules. But significant deviations are observed for complex molecules. The reason for this could be that all collisions do lead to the formation of products. The collisions in which molecules collide with sufficient kinetic energy and proper orientation, so as to facilitate formation of new bonds, are called effective collisions.